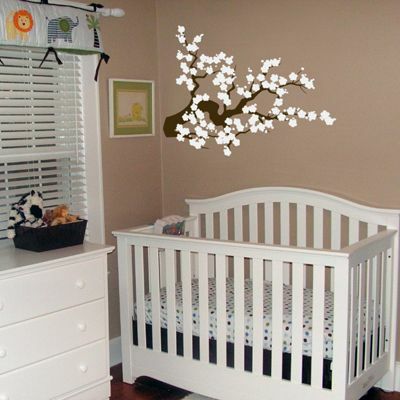 This beautiful cherry blossom branch wall decal is a great addition to any room! It's shown here with a dark brown branch and white flowers, however you can pick whichever two colors you would like! You can also add on an additional pack of accent blossoms, in the color of your choice! Pictured is our Regular sized cherry blossom wall decal, which measures 26.5" high by 35.5" wide, including the blossoms, and is available 'Reversed' as well. Second image shows the branch with beige matte accent blossoms. Only a fraction of the blossoms are pictured in this image. We also offer this decal in a LARGE size, which measures 43" high by 56" wide. Please note: The blossoms will come separately from the branch. Simply cut them apart and place them however you like! This will give you creative control over your decals, so that you can customize the look of your space!